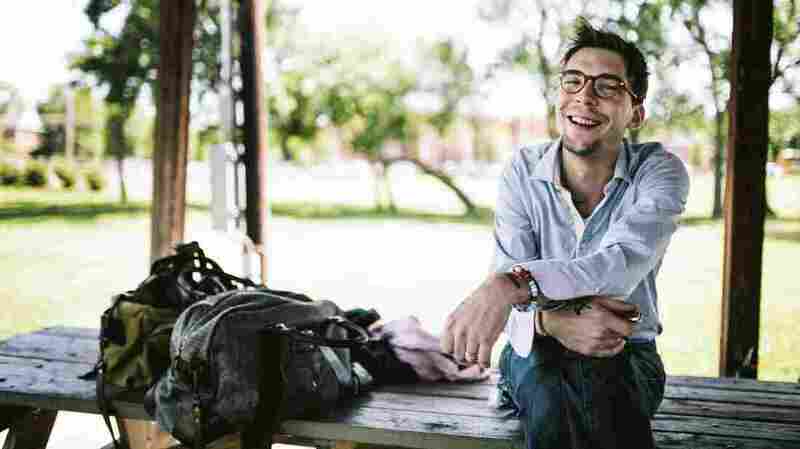 First Listen: Justin Townes Earle, 'Single Mothers' Earle's latest songs have a new angle on the mercurial nature of infatuation; he's acknowledging how taxing it can be to live through youthful cycles of passion that flare up and flame out so quickly. Justin Townes Earle's new album, Single Mothers, comes out Sept. 9. Justin Townes Earle's album covers have always offered variations on a theme: For each of his full-lengths, he's posed in a different setting with a different anonymous woman. But for Single Mothers, his fifth album, the newly married Americana fixture keeps his own mug out of the picture altogether and casts a kid in his place. The strategically selected stand-in is 13-year-old Sammy Brue, who's also a singer-songwriter (more than a little influenced by Earle), and who's shown here holding hands with a girl his own age. It's as if Earle means to suggest that certain parts of his gig are a younger man's game. He played the rakish rounder in a few of his early songs — insouciantly swinging, pre-electric, country-style tunes — before setting that persona aside. Since then, without limiting himself to strict autobiography, Earle has moved between evocative portraits of place set in knotty emotional frames, prickly confessions of destructive patterns, and melancholic eloquence in the wake of short-lived love affairs. Earle's latest songs have a new angle on the mercurial nature of infatuation; he's acknowledging how taxing it can be to live through youthful cycles of passion that flare up and flame out so quickly. Even his vocals, with their conversational yet unclasped, jazzy phrasing, have developed a fittingly frayed edge. "Everyone that walks out takes a bit more of you with her / and you're still startin' fires and burnin' pictures," he chides in the rollicking, riff-driven "Burnin' Pictures." In "Wanna Be a Stranger," he sings as someone craving relief from the volatile feelings that can overwhelm young relationships, and in the spindly, twangy R&B tune "Time Shows Fools," he's a man stripped of romantic delusions. Amid all this reflection on drama, Earle also toys with what it might look like to settle into love, which is where the hooky, new-school rockabilly number "My Baby Drives" comes in. Easily the most frolicsome cut on the album, it makes yielding control in a partnership sound pleasurable. The pining, lovelorn character Earle plays in the spare, fingerpicking-and-steel guitar track "Picture In A Drawer" is almost sheepish about his state, quipping, "I'm not drownin' / I'm just seein' how long I can stay down." The song unfolds as a phone conversation between a worried mother and a wound-nursing son — another relationship that has occasionally surfaced in Earle's songwriting. Several albums back, Earle addressed family dynamics in the arresting ballad "Mama's Eyes," in which he described traits he inherited from his famous songwriter father Steve Earle (unchecked impulsiveness, addictive tendencies) and his civilian mother (clear-eyed perspective). The song's low-pitched, dad-targeted resentment came from an essentially self-interested place, which isn't the case with the younger Earle's new rumination on parental track records, "Single Mothers." This album's country-soul title cut shares some of the same plainspoken antipathy toward men shrugging off paternal responsibilities that John Prine wrote into "Unwed Fathers" three decades ago. So this time around, Earle feels first and foremost for his long-suffering mother, who had to raise him on her own. Without dulling the potency of his expression, he's given it greater dimensions. That's hardly kid's play.